Just like newspaper ads, you can set up an advertisement about your business / product / services online. Online advertisement can be placed anywhere including search engines (e.g. Google, Bing, or Yahoo), social media (e.g. Youtube, Facebook, or LinkedIn), forums (e.g. hardwarezone), or any other external websites. For starters, we would recommend you to start with search engine ads first, particularly Google ads, as it is currently the largest source of traffic on the Internet and it is easy enough to set up on your own. If you are searching on Google, you may see some of the results are in colored background and some are located smaller on the sidebar of the Google result page (see screenshot). These search results are actually advertisements (namely Google Adwords), and not actually the organic result of your Google search. As long as you are paying, you will be able to appear there regardless on how your organic search result for your keywords perform. The advertisement model adapted by Google Adwords is called PPC (Pay Per Click), which means advertisers (you) will only pay if people click on your ads. Furthermore the amount of money you are paying for every click varies depending on the keyword. If you want your ad to appear on popular keyword searches, you will have to pay slightly more compared to on the less popular ones. Google uses a bidding system to decide the minimum cost of appearing in a keyword search. You can decide the amount of money you are willing to pay for every click, but if your bid is too low compared to your competitors’, your ad will appear less often or won’t appear at all in the search results. A common question being asked regarding Pay Per Click is “What will happen if my competitor purposely clicks my ads for the purpose of blowing my budget?”. The answer is: Google has its own algorithm to decide whether a click is valid or invalid. You will not be charged for such invalid clicks. Read more on Google support article about invalid clicks. So, let’s get started to set up your first campaign! Go to http://adwords.google.com/ and sign up. Alternatively you can use any Gmail or Google App account. 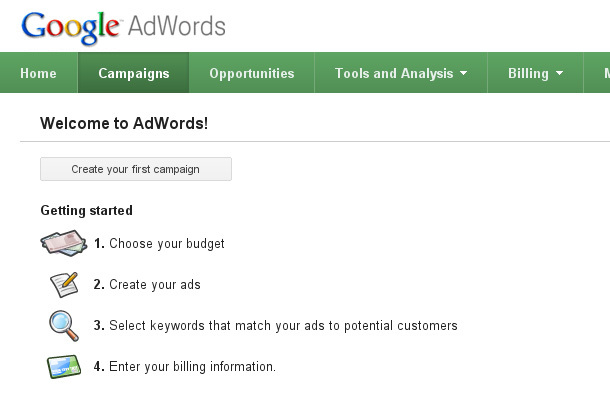 Follow the steps on the sign up until you see a Welcome to Adwords! screen. Click “Create your first campaign” on the welcome screen to get started and you will see the following screen. Networks: Untick include search partners. We recommend this setting so that you can check out your ad performance from only Google Search results. It is better to start small. Location: Choose Singapore if you are targeting the Singapore market. Bidding and budget: Choose “I’ll manually set my bids for clicks” (recommended so that you will understand how to adjust your bids, and how it affect your ads’ performance in the later stage). Ad extensions: Ignore it at the moment. Note: Some of the recommendation in this step is meant to help you get started easily. Feel free to adjust based on your preferences. On the previous step, you were creating a campaign. One campaign may contain number of ads, meaning different ads may share the same advertising budget. You are free to create different ads, each targeting different keywords in one campaign. You will see the following page to create your first ad. Name your ads. For example if I am running a website campaign, I may have one ads for e-commerce website and another ads for corporate website. Each ad contains a headline, 2-line description, and URL. You can see the preview of your ads on the Ad Preview section as you type. Note that there is a maximum limit on the number of characters you can use on your ads. Select your keyword. 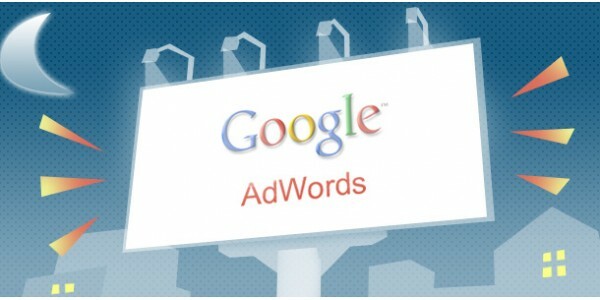 Type in the search keyword you want to advertise your ads in on the keyword box. 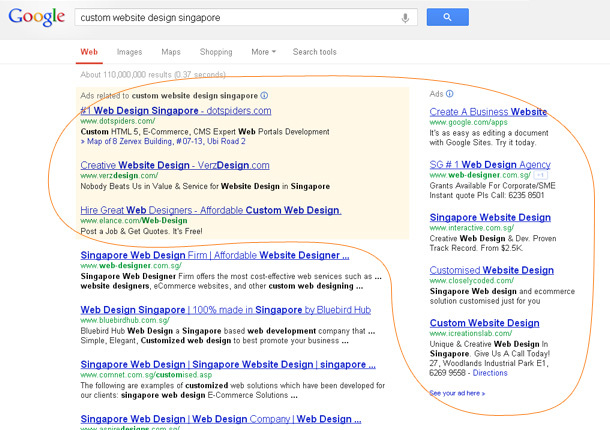 If I add “website design” as keyword, it means my ad will appear when people are searching for “website design” in Google. You can add as many as keywords you want, just try to explore different keywords and see how they perform. If you are more of an IT-savvy person, you can try to explore this Google Keyword tool to help you choose the suitable keywords to promote your website. 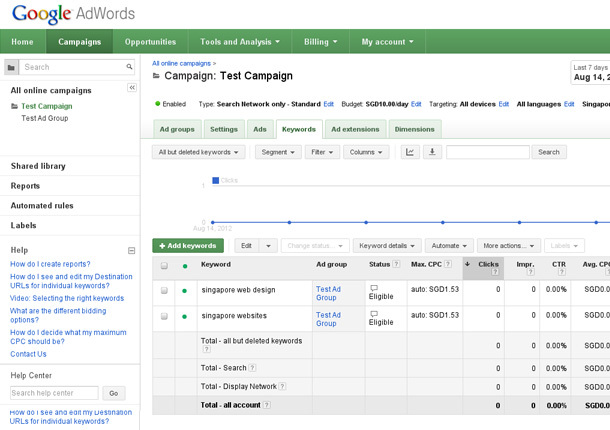 By completing this page, you are done creating your first Adwords campaign. Your ads are now ready to be run. The next step is to set up your billing information. Your ads will only be active after you setup your billing information. Click Save and continue to billing to do the setup. The instructions are quite straightforward to follow. You will need to enter your country, prefered billing method (We recommend post-pay billing / credit card for less hassle). After you click ‘Save and Activate’ on the last step, your ads will be activated automatically, and you will start seeing your ads on Google search after ads validation. 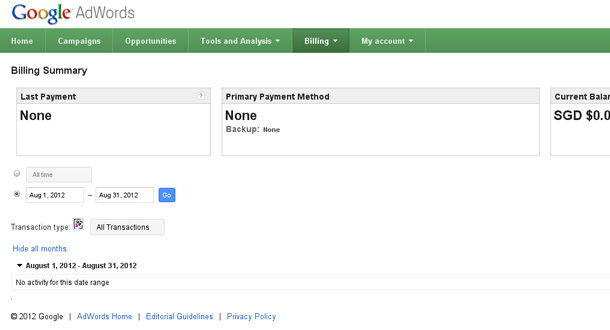 First is your billing information, to show how much you will need to pay for the ads. 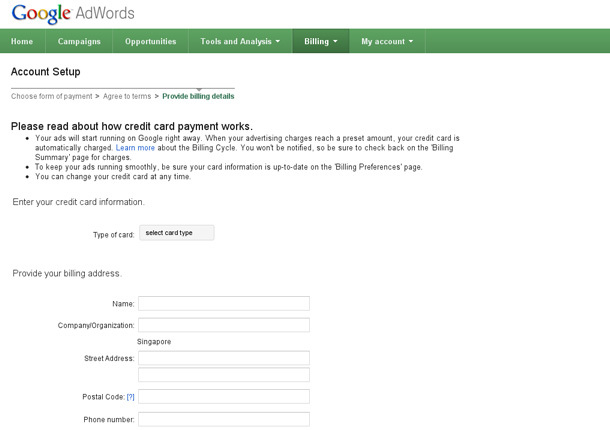 Just go to Billing / Billing Summary as shown in the screenshot. In this page you will be able to filter the report by date, see how many clicks you are getting per day, and how much you will need to pay. The next page is your ads performance details. 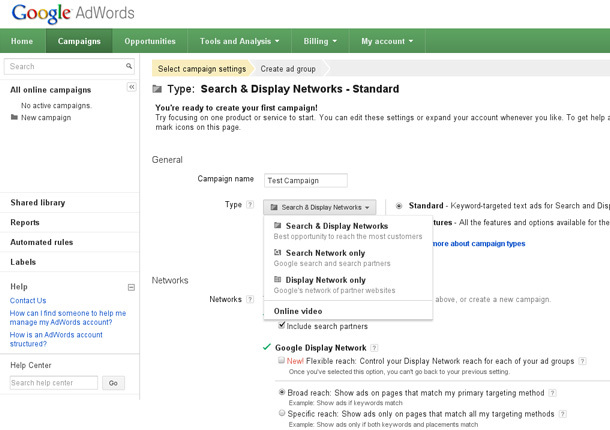 Just go to Campaign, select your campaign, and click on Keywords sub tab. Here you will be able to view how each keywords have performed. Using the data from this page, you can do your adjustment accordingly. In a nutshell, Google Adwords is an advertisement tool you may want to consider seriously to generate more traffic into your website. This purpose of this article is to help you understand how Google Adwords works, and start your own campaign quickly in five simple steps. Keep experimenting with different keywords and settings to find out which combination works best for you.